City University London's Emeritus Professor of Engineering Materials, Barrie Mintz, has won the prestigious Institute of Materials, Minerals and Mining (IOM3) Vanadium Award for a research paper he co-authored with colleagues Dr. Kevin M. Banks and Dr Alison Tuling, entitled "Influence of V and Ti on Hot Ductility of Nb Containing Steels of Peritectic C Contents". 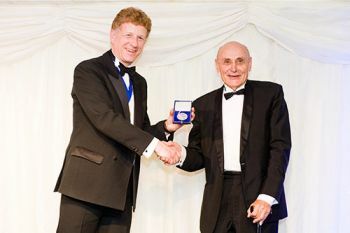 The award was presented to Prof Mintz last month by IOM3 President, Jan Lewis, during the IOM3 Premier Awards Dinner in Central London. Professor Mintz joined City as a lecturer in Materials in 1979, and culminated his career at City as an Emeritus Professor, retiring in 2004. "On retiring at the age of 65 in 2004, I was awarded a Royal Society Leverhulme Trust Senior Research Fellowship in Arts and Sciences to complete all of my remaining research papers and work. However, after this I still wanted to continue my research work on steel. To do this, I collaborated with researchers at the University of Pretoria, South Africa, to work on exciting new steels which are now being developed and have high strengths (up to1000MPa) and good ductility. These are being used in the automotive industry to lighten the weight of cars so as to save fuel and reduce carbon emissions." Professor Mintz, who also has a distinguished research record within the International steel casting and processing industry, continues to make his mark by helping to solve casting problems and to develop high-strength steels for application in the oil and gas industry. "These steels are difficult to cast and the work I am doing helps the Steel Companies with their casting problems. The work is also being supported by the South Korean Steel Company, POSCO (the third largest in the world). In addition to this research, I am also working on oil pipe and oil platform steels which always have a small amount of niobium present to give them their high strength. My work has shown that if a further small addition of vanadium is made to the melt, this cracking can be prevented. It was for this reason that I was presented with the Vanadium award".